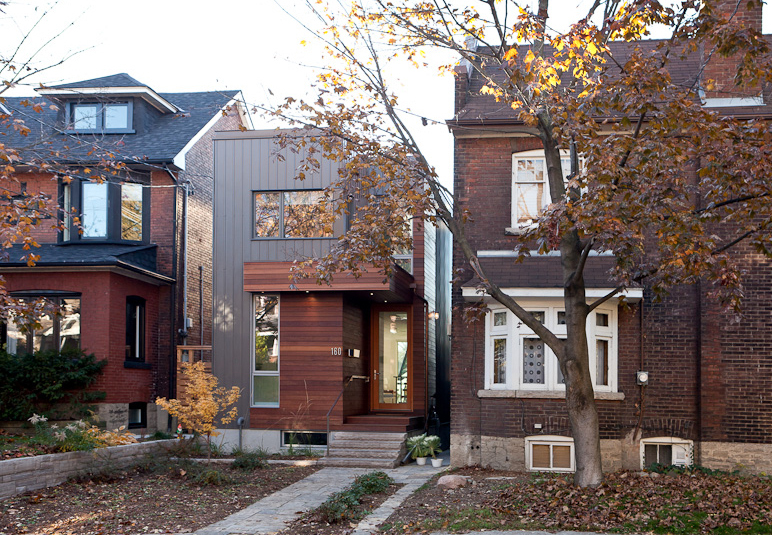 Young architects often design homes for their parents. But for Toronto's Julia Knezic, it was an especially intimate job: her mom Susan Farkas's new house is next to her own. When the property became available, she lured her parents into moving from their suburban neighborhood. "My mom said, 'Fine, but I want a new house.' "
It was a deal: Julia designed a new 2,100-square-foot open-plan house, with generous public rooms and only one bedroom, for the site. The process became more intense when her father passed away—and more so as Julia gave birth to her two kids. But Julia's mother moved in, and welcomed Julia's clan to live in the basement as they remodeled their own place. "This was conceived as a house for one person," Julia explains,"but the idea was to make the spaces as comfortable as possible for the whole family." And with an intergenerational mix of decor and two happy kids, it's working out fine. Farkas—preparing a snack for the grandkids—deferred to her daughter about the design of the interior. "She obviously trusted my taste," Julia says. "She never shied away from the modern aesthetic." The Danish teak dining set belonged to Susan's sister-in-law. The galley kitchen, in classic white, is the one splurge within the interior: it was custom made by Bulthaup from their B1 series. A narrow window, with a frosted bottom panel, balances views and privacy. In the living room, Julia and Nick's furniture—a Case Study bed from DWR, a table by Bookhou and a lounger by Brothers Dressler—shares spaces with a teak hand-me-down. The backyard, enclosed by a cedar fence, is shared between the houses. Custom birch millwork, fabricated by Toronto's Gibson Greenwood, defines a home office space on the second floor. Susan brought the yellow couch at right when she emigrated from Hungary in 1969. Operable skylights help ventilate the house, which has no air-conditioning; a glass railing helps bring light down into the dining room. Susan loves the reveal detail on the handrail at the top. Julia designed the stair, which has no risers and only one steel support beam, to bring light into the lower floors.